What is learning? How does our brain translate facts into knowledge, then store it away for later use? Does our education system catalyze or act as a barrier to learning? What about creativity, a skill that is so crucial to numerous jobs in today’s complex workforce? Do schools foster the growth of creativity and intellectual curiosity? This nine-month feature will dive deep into the realm of both the scientific and psychological aspects of education, both at a global level and a school level. Each month, I will focus on a specific issue or idea and explain how it pertains to the EHS student body. Topics will range from standardized tests to classroom creativity, as well as a feature on how the United States as a whole stacks up against other countries to end the project. This feature will focus on providing an overview about learning as a biological process that occurs in our brains as well as the idea of diverse learning and how diversity when teaching is imperative to success in the classroom. Learning begins when fibers in the brain called dendrites grow out of neurons (brain cells) (n.a. “The Science of Learning”). All knowledge is stored in our neurons, and form a neuron network in our brain (Hendel-Giller “The Neuroscience of Learning”). These dendrites must grow out of a previous fiber, and do so when someone writes about, talks about, or practices something (n.a. “The Science of Learning”). This implies that newly acquired skills must be built off previously learned skills, as learning is essentially the growth of dendrites. Once one dendrite grows into the vicinity of another dendrite, a connection point called a synapse is formed. On average, there are about 10,000 connections per neuron. Messages are transmitted via electrical impulses across the synapses. When one practices a certain skill, the dendrites acquire a layer of fat, which allows for both a faster signal speed and less interference. With enough practice, a double connection may form, which will last longer and thus allow the individual to remember that certain skill for a longer period of time. However, without repetition, these dendrites are ephemeral unless their presence is solidified by constant practice. These findings are supported by experiments conducted by psychologists in the 20th century; a study conducted by Baddeley in 1982 culminated in the Total-Time Hypothesis, which states that the time spent studying or practicing a given subject is directly proportional to the amount of information learned (Matlin “Memory”). 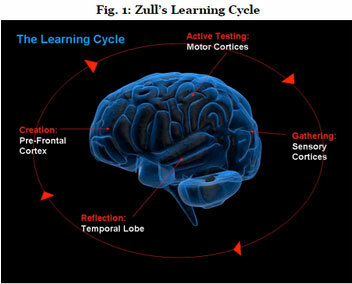 In 2002, biologist Dr. James Zull proposed the learning cycle model, which consists of four phases: (1) gathering, (2) reflecting, (3) creating, and (4) active testing (Hendel-Giller “The Neuroscience of Learning”). Each of these four phases occurs in one region of the brain, as depicted in Fig. 1. The first phase, gathering, involves the sensory cortices that receive input from external stimuli. This is the brain’s first exposure to the new material, and therefore allocates most of it’s focus and energy during the learning cycle to ensuring the raw materials are properly gathered. The second phase of the learning cycle, reflection, is when the individual takes time to reflect, analyze, and understand the sensory information obtained during phase one (Hendel-Giller “The Neuroscience of Learning”). This phase is private, and requires ample time and space for the individual to digest the raw material into memories and skills. If the learner engages in this phase, they undergo active learning, and the information is deeply processed. However, if, for example, the learner is cramming before a test, they lack this reflection time, and learning will be shallow and disconnected. When learners reflect on the learned material, they are forming conscious and subconscious connections to material they already know (Hendel-Giller “The Neuroscience of Learning”). As previously stated, in order to learn, one must base their newly acquired knowledge off of previous knowledge, because learning is the growth of dendrites. By reflecting on the learned material, the learner has time to establish numerous dendrite connections, and thus gain a deeper understanding about the material. The third phase of the learning cycle is creation, where the learner takes received and digested information and extrapolates to create ideas, symbolic representations, and plans (Hendel-Giller “The Neuroscience of Learning”). During creation, one manipulates information to expand on connections created during phase two and create new relationships between ideas, thereby creating a understanding unique to the learner. The concept that this phase is unique to the learner supports the fact that diverse teaching methods are essential in order to appeal to a large range of students; what may work for one student may not necessarily work for another. The final phase of the learning cycle is active testing, which involves conveying information into physical events (Hendel-Giller “The Neuroscience of Learning”). Examples of active testing includes engaging in a discussion or debate about the learned material or designing an experiment to test a concept. There are a myriad of theories in existence that attempt to classify people based on their cognitive functions and personality traits. One idea that all these theories and tests have in common is the idea of diversity; there is no “one-size-fits-all” mold for humans, especially when it comes to learning. In this feature, the impacts that Gardner’s Theory of Multiple Intelligences and the Myers-Briggs assessment have on learning will be analyzed. Psychologist Howard Gardner staunchly opposed the idea of measuring intelligence through IQ, and instead developed his multiple intelligences theory (Kasschau “Psychological Testing”). He hypothesized that there are eight types of intelligences: (1) logical-mathematical, (2) linguistic-verbal, (3) intrapersonal, (4) spatial, (5) naturalist, (6) body – kinesthetic, (7) musical, and (8) interpersonal. The core idea of Gardner’s Multiple Intelligence theory is that intelligence isn’t defined by the ability to perform well in school, but is instead proficiency or expertise in one of the eight types of intelligence. Gardner’s theory of multiple intelligences provides insight as to how crucial diverse teaching methods are to classroom success. Not all students have the same levels of each type of multiple intelligences, and therefore, teachers must use a variety of methods to please all students and maximize learning. A spatially intelligent person, for example, has the ability to translate ideas into images, and they tend to be the learners that need visuals such as diagrams to effectively learn. If an educator only lectured, without visuals, then the spatially intelligent person wouldn’t be at their optimum level. The Myers-Briggs Type Indicator (MBTI) assess the preferences and cognitive functions of test takers, and this sheds light on the preferred or optimal learning type of an individual (GSU “Student Learning and the Myers-Briggs Type Indicator”). The MBTI test is based on four sets of preferences, for a total of 16 different personality types. The four preferences are: extraversion vs. introversion, sensing vs. intuition, thinking vs. feeling, and judging vs. perceptive. When combined, an individual is presented with a four letter code, such as ENFP or INTJ, which they can then use to guide their learning. Because each type has different methods of learning material, teachers must diversify their teaching methods to improve overall learning. The first preference, extraversion (E) vs. introversion (I), assesses whether the student is energized by the thoughts and presence of others (extravert (E)) or by being alone and contemplating about their own ideas (introvert (I)) (GSU “Student Learning and the Myers-Briggs Type Indicator”). Extraverted students learn best by teaching their acquired knowledge to other peers and working in groups. Introverted students prefer to work alone, and tend to be “big picture thinkers” who prefer to learn by connecting ideas. Sensing (S) vs. iNtuition (N) assesses how a student takes in information from the external world (GSU “Student Learning and the Myers-Briggs Type Indicator”). Sensing students prefer concrete knowledge that can be obtained via the five senses; intuitive students seek patterns and relationships between ideas, and tend to grasp more abstract ideas. Sensing students tend to prefer structured and linear lessons, whereas iNtuitive students prefer discovery and “big picture” learning. Activities such as compare and contrast tables, concept maps, and Venn diagrams appeal to iNtuitive students. Thinking (T) vs. feeling (F) assesses how students make decisions and what factors they’re based on (GSU “Student Learning and the Myers-Briggs Type Indicator”). Thinking students make their decisions based off fairness and logic; feeling students tend to make decisions based off of human values. Thinking students tend to prefer action-oriented, clear, and succinct class objectives. Feeling students tend to prefer to work in harmonious groups. Judging (J) vs. perceptive (P) assesses how students treat deadlines and how they plan out time (GSU “Student Learning and the Myers-Briggs Type Indicator”). Judging students tend to be more deliberate and are wary of deadlines. Perceptive students tend to be spontaneous and adaptable, and see deadlines as “suggested due dates,” unlike judgers. A free version of the Myers-Briggs test can be taken here. Social studies teachers Ms. Chagnon and Mr. Bodi both agree that when it comes to effective education, there is no “one-size-fits-all” mold. To appease a wide range of students, both teachers use a wide range of activities to teach students concepts in psychology, history, and government. Ms. Chagnon states that the teaching style she uses is very dependent on the students and what they’re interested in. In class, she alternates between five different teaching methods, both to satisfy the needs of all students while simultaneously requiring students to adapt to different learning styles. Mr. Bodi espouses a similar philosophy; in his AP psychology class, he provides his students with diverse teaching methods: one day, he’ll write out notes on the board for visual learners and another day he’ll lecture for auditory learners. Some days in class, students will have discussions and other days they will be figuring out psychology puzzles. Despite the fact that there is a variety of methods to learn new concepts, in order to maximize retention and understanding, one must ensure that they are using methods that are high on the Depth of Knowledge (DOK) scale (see Fig. 2). The DOK scale organizes different learning activities based on how deep the students’ understanding must be in order to perform that certain task. Activities are rated on a scale from one to four, with four requiring deep knowledge and extended thinking and one being simple recall. Social studies teacher Ms. Chagnon uses the DOK chart in her classroom to ensure students have a solid understanding of the material. She states that the majority of the activities she requires students to do are levels three and four, as they require a deep understanding of knowledge. To assess this, Ms. Chagnon assigns reflections, application-based assignments, and projects. She states that students like to explore, and only at levels three and four do students have the ability to explore and apply connections. Several studies have found that deep learning is more effective than shallow learning. 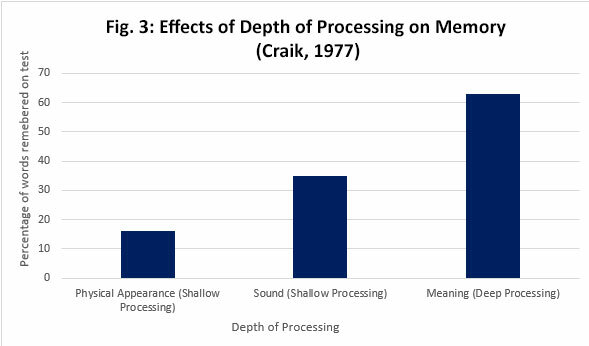 A study conducted by Craik in 1977 experimented with how different types of processing affect learning and memory (Matlin “Memory”). The test subjects were given a set of words accompanied by statements describing the words; the subjects were to decide whether these statements were true or false. There were three groups: one group only saw the words (shallow processing), one group heard the words (shallow processing), and one group analyzed the meanings behind the statements (deep processing). The first round, the subjects were provided with both the word and the statement. The second round, the subjects were only provided with the statements, and the subjects were to indicate whether each statement was true or false. The results, illustrated in Fig. 3, portrays that deep processing is significantly more effective than shallow learning. How is this relevant to Exeter High School? During mid-September, I conducted a survey among 20 upperclassmen at Exeter High School and asked them to fill out a sheet detailing what they did in class over the course of one week in order to gain a holistic view on how diverse teaching and learning really is at Exeter High School. The subjects in question were: science, social studies, English, foreign language, and math. The results are depicted below in Fig. 4. 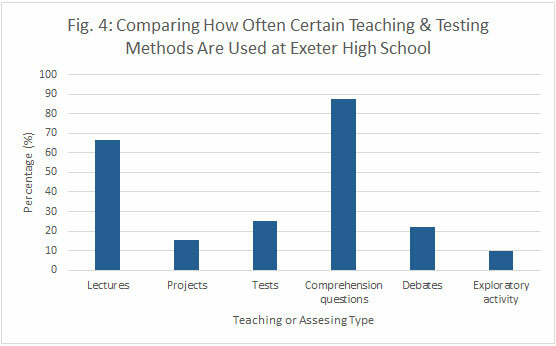 As portrayed in the chart, lectures and comprehension questions appear to be the most popular teaching method at EHS, being used 66.7% and 87.5% of the time, respectively. Projects and exploratory activities (such as deriving equations and POGILs) tend to be the least popular activities, being used 15.3% and 9.7% of the time, respectively. Debates and tests are used slightly more frequently than projects and tests, being used 22.2% and 25.0% of the time, respectively. While there appears to be some diversity in teaching methods at EHS, there is still potential room for improvement. Currently, auditory learners are benefitting more than the rest, due to the popularity of lectures at Exeter. Comprehension questions appease the linguistic-verbal learners, as they allow student to express their understanding through writing or speech, depending on the nature of the class. Due to the diversity of students, varied teaching methods are imperative to success in today’s society. In order to maximize learning, teachers should use different teaching styles in order to appease all students. Theories such as Gardner’s Multiple Intelligences and the MBTI prove that there can never be one-size-fits-all mold, especially when it comes to education. The next feature will explore the psychological impacts of school-induced stress on students, and how this impacts their performance. It will be published on the website around late-December, early-January. Bligh, Donald A. “Evidence of What Lectures Achieve & Factors Affecting Students’ Attention.” What’s the Use of Lectures? San Francisco: Jossey-Bass, 2000. 3-56. Print. Brightman, Harvey J. “GSU Master Teacher Program: On Learning Styles.” Student Learning and the Myers-Briggs Type Indicator. Georgia State University, n.d. Web. 18 Oct. 2014. Freeman, Scott, Sarah Eddy, Miles McDonough, Michelle K. Smith, Nnadozie Okoroafor, Hannah Jordt, and Mary P. Wenderoth. “Active Learning Increases Student Performance in Science, Engineering, and Mathematics.” Active Learning Increases Student Performance in Science, Engineering, and Mathematics. PNAS, 12 May 2014. Web. 7 Aug. 2014. Hendel-Giller, Ronni, Cindy Hollenbach, David Marshall, Kathy Oughton, Tamra Pickthorn, Mark Schilling, and Giulietta Versiglia. “The Neuroscience of Learning: A New Paradigm for Corporate Education.” The Neuroscience of Learning: A New Paradigm for Corporate Education (n.d.): 1-19. The Maritz Institute. The Maritz Institute, May 2002. Web. 19 Sept. 2014. Kasschau, Richard A. “Unit 4: Learning and Cognitive Processes; Chapter 13: Psychological Testing.” Glencoe Understanding Psychology. New York: McGraw-Hill/Glencoe, 2008. 238-354. Print. Kihlstrom, John F. ” How Students Learn — And How We Can Help Them.” How Students Learn. Department of Psychology, University of California, Berkeley, 8 Mar. 2011. Web. 18 Oct. 2014. Leonard, Kristi, Erin K. Noh, and Michael Orey. “Introduction to Emerging Perspectives on Learning, Teaching, and Technology.” – Emerging Perspectives on Learning, Teaching and Technology. Department of Educational Psychology and Instructional Technology, University of Georgia, 2007. Web. 18 Oct. 2014. Matlin, Margaret W.. “Chapter 7: Memory.” Psychology. 2nd ed. Fort Worth, Tex. : Harcourt Brace Jovanovich College Publishers, 1995. 214 – 235. Print. Norman, Webb L., and Others. 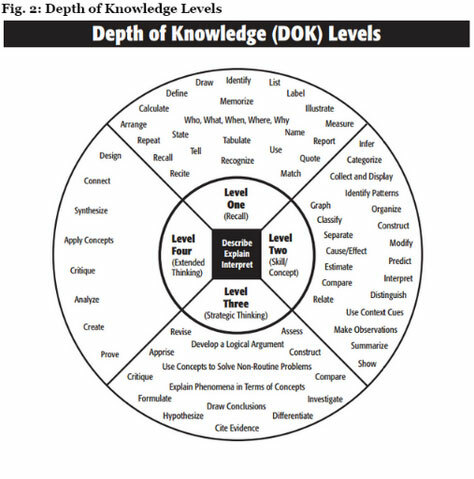 “Depth of Knowledge (DOK) Levels.” Wisconsin Center of Educational Research. University of Wisconsin-Madison, 2 Feb. 2006. Web. 4 Sept. 2014. Comments about this and any other article in EHS Press may be submitted to EHSPress@sau16.org. Signed comments that provide EHS Press readers with additional viewpoints or information regarding issues published in EHS Press will be posted in the “Letters to the Editor” section under the Debatable tab.